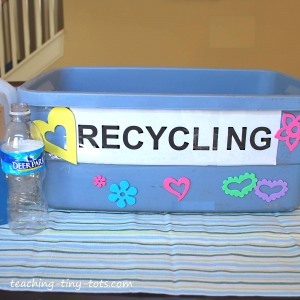 Great way to introduce recycling is by making your own bin. After waiting 2 months for one to arrive from the city we decided to make our own. It was a perfect way to demonstrate living green to toddlers. Print out the word Recycling in large letters. Empty a bin and print label. Put clear packing tape over the letters to keep it drier. Put stickers on to decorate. Print out list of items your city allows to be recycled. Tape to inside lid. Printable Recycle Symbol to color or put on the recycle bin. Print the list of items to be recycled in large print for your child. Collect a sample of each item. You can go one step farther and label each item and have your child match the words. It didn't take long for the girls to learn what items to recycle. One day they brought home their juice boxes from school and asked if they could recycle it. Another day they brought home their drinkable yogurt containers. When I said, I am not sure that is recyclable...they said, "Yes, mommy, it has the sign on the bottom!" ...and it did! The universal recycling symbol is an internationally-recognized symbol used to designate recyclable materials. It is composed of three arrows which are often green with a black outline or white with a black outline. A book is a great way to introduce a toddler science activity. Go to the library or a bookstore and find a book on recycling or Earth Day. Some suggestions are listed below. Seeing Pictures in a book or online. If you Google "garbage dump picture" you can get pictures to help show what garbage accumulation looks like. Hearing and listening to directions given. Oral Explanation of why it is important to recycle. Talk about the different things you can recycle or what is made from recycling.